The Architecture: The Visual Guide book is only $20 (50% off) over on Amazon . This has to be one of the classist books about Lego out there. 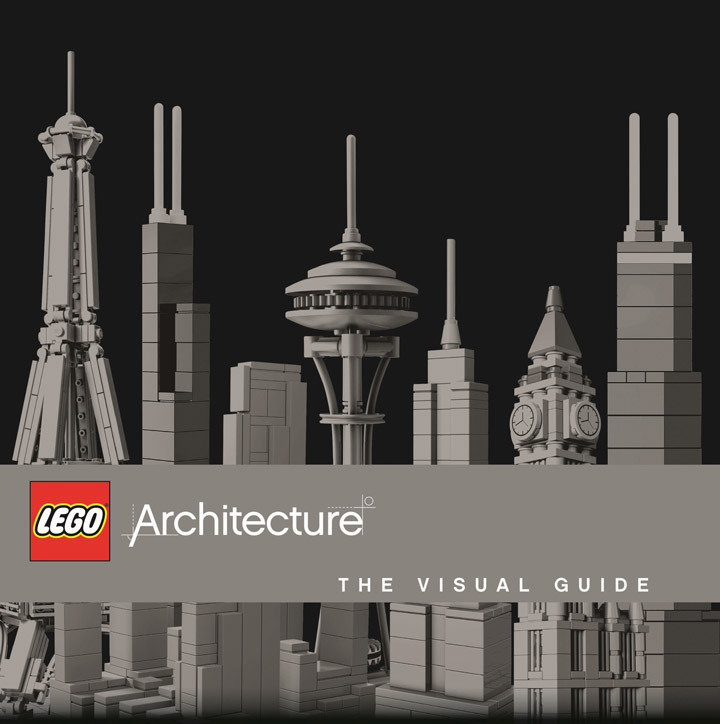 It features 232 pages of detailed information and photographs of the Lego Architecture theme. It covers all of the recent releases: Solomon R. Guggenheim Museum, Fallingwater, The White House, Farnsworth House, Rockefeller Center, Robie House, Brandenburg Gate, Sydney Opera House, Big Ben, Villa Savoye, Sungnyemun, The Leaning Tower of Pisa, Imperial Hotel, United Nations Headquarters, The Eiffel Tower, Trevi Fountain, John Hancock Center, Willis Tower, Empire State Building, Seattle Space Needle, Burj Khalifa, and the Marina Bay Sands. This book is perfect for architects, architecture fans, George Costanza, and coffee tables. 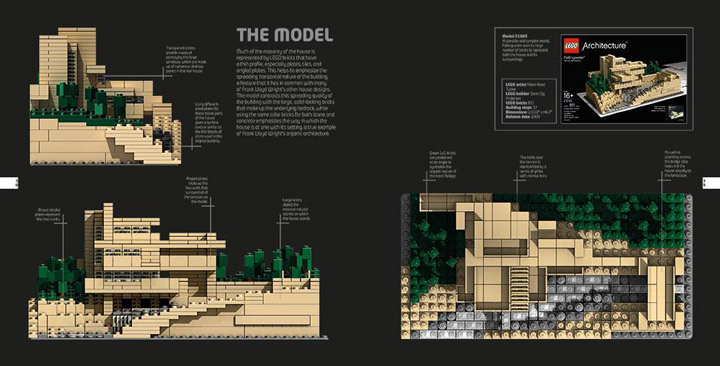 The LEGO Architecture: The Visual Guide over on Amazon: here. 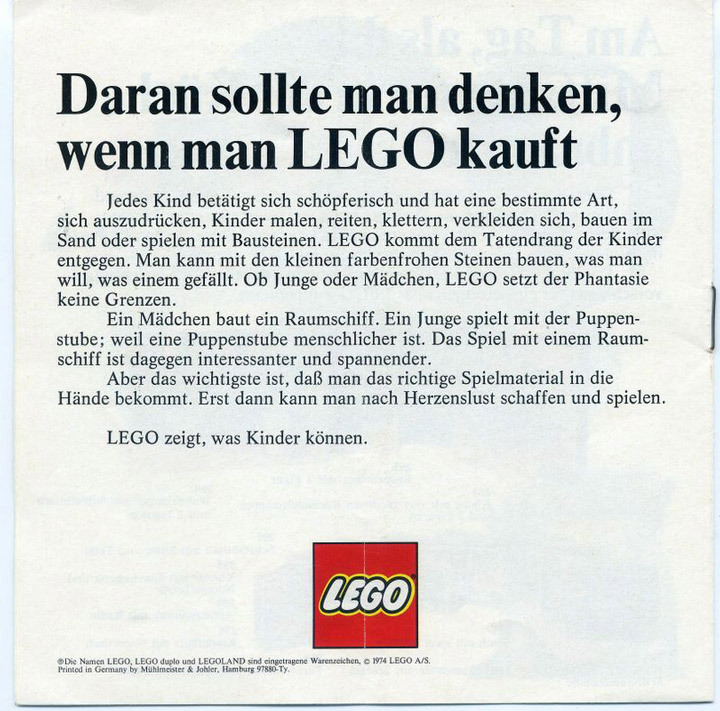 Lego has a a long history of advertising. Some of their campaigns have been amazingly creative. And some have a message that people remember forever. 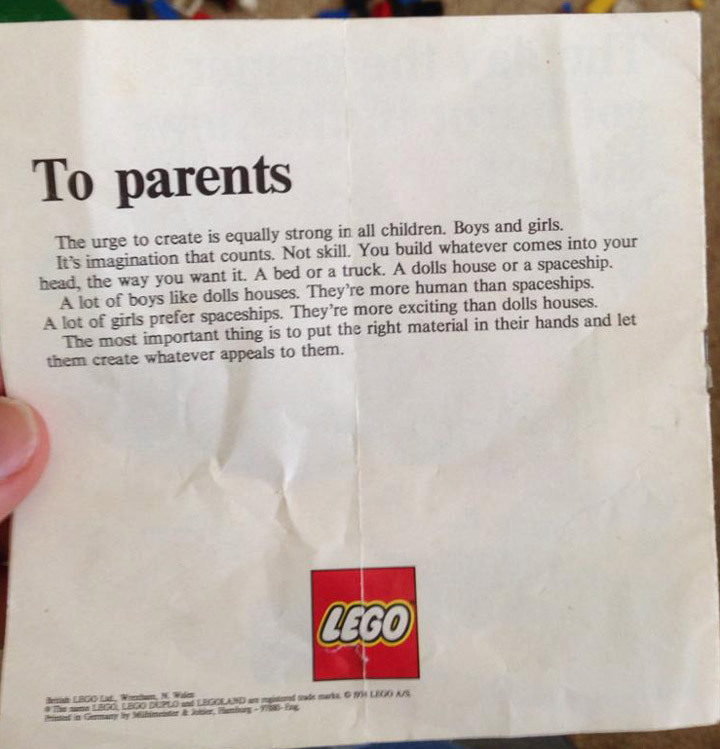 Recently people have rediscovered a small pamphlet that Lego produced in 1974. It is note that explains to parents that children have a desire to be creative that can and should manifest itself anyway that it can. It is a great message to teach, and shows a a side of Lego that seems to have been dissolving over time. “The urge to create is equally strong in all children. Boys and girls. It’s imagination that counts. Not Skill. You build whatever comes into your head, the way you want it. A bed or a truck. A dolls house or a spaceship. A lot of boys like doll houses. They’re more human than spaceships. A lot of girls prefer spaceships. They’re more exciting than dolls houses. Let sent this note out across the world, and had it translated into other languages. A German version has also been rediscovered. The Lego Story. 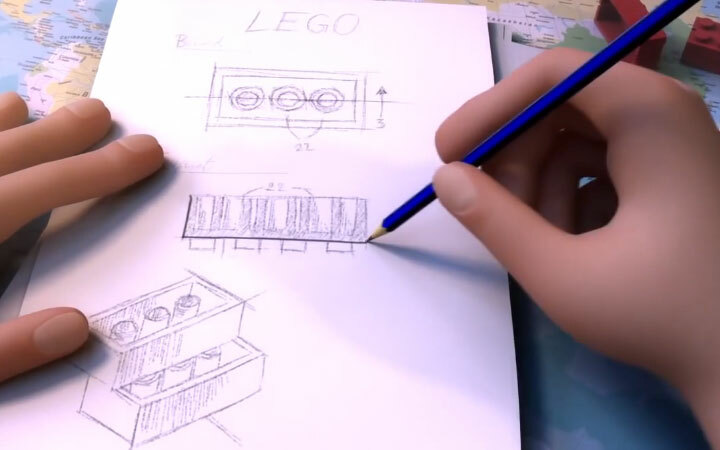 A Beautifully Animated History of Lego. 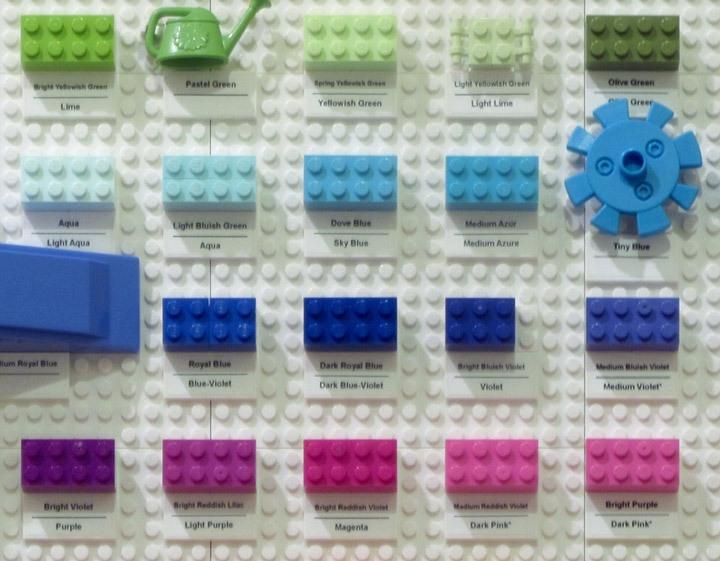 Have you ever wondered where the Lego brick comes from? Well, for the 80th anniversary of The LEGO Group a beautifully animated history of the company was produced. 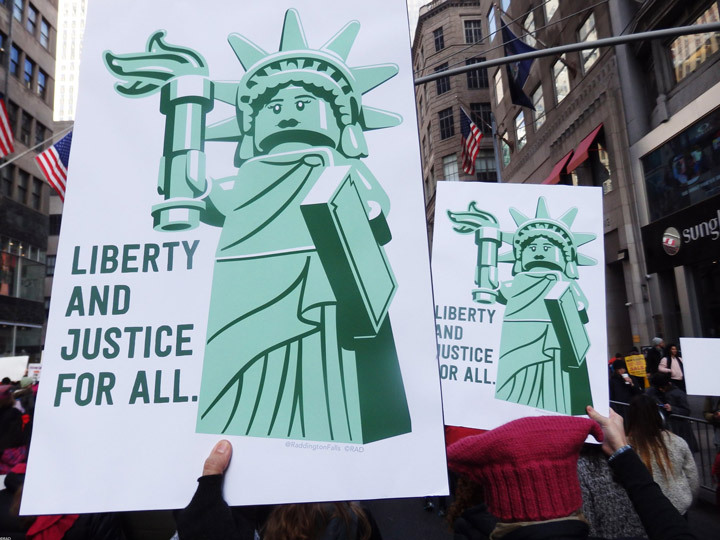 The Lego Story focuses on the history between 1932 to 1968. This story has it all, a failed business, new ideas, a tragic fire, the invention of the Lego System, and the resulting success. It is easy to compare the quality of animation with some of the work that Pixar has done, which is saying a lot. This really is a must see video. Lego also made a little bloopers and outtakes reel. Even poking fun at everyones worst nightmare: stepping on a Lego. Haha… ouch. 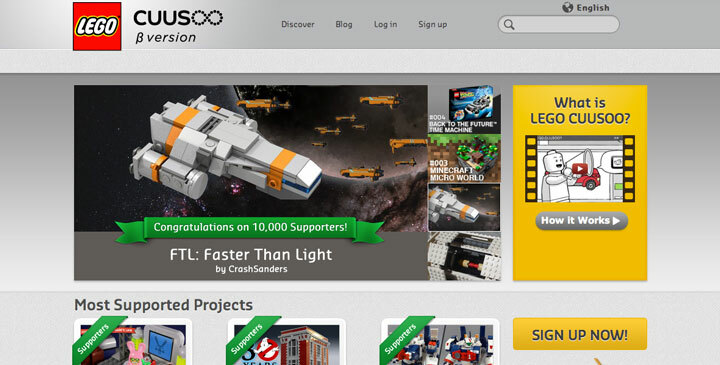 Lego has been running the Lego CUUSOO project for a couple of years now. 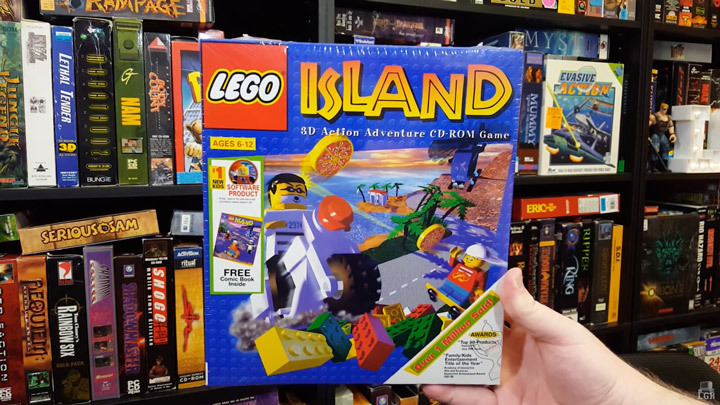 Most Lego fans are familiar with the site, but may not know just where it came from. Brick Fanatics has written up a great article containing the history of the CUUSOO project and where it is going. It all started as a tiny side project from Japan and is currently on the verge of becoming mainstream. All thanks to a little Lego DeLorean (and Minecraft ). Back before the Pirates, before the Minifig, even before Duplo, Lego introduced the Town System. With this new system came the first named beams and printed bricks. Usually produced on white 1×6 and 1×8 bricks. These printed bricks were so popular at the time that there were hundreds and hundreds of varieties available in different colors and typefaces. 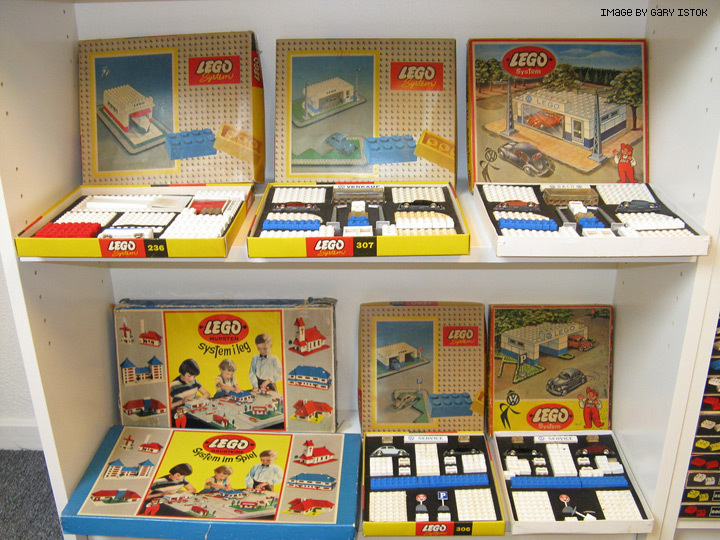 The very first printed/named bricks hit the stores in 1955, just 6 years after Lego introduced their original sets. Since these bricks were there in the beginning, their availability matches the spread of Lego across Europe. First appearing in Danish, Norwegian and Swedish. Originally these bricks were available in a Named Beams set (Set No. 1224). As Lego started selling in new countries, they started translating these printed/named bricks in all the different languages. 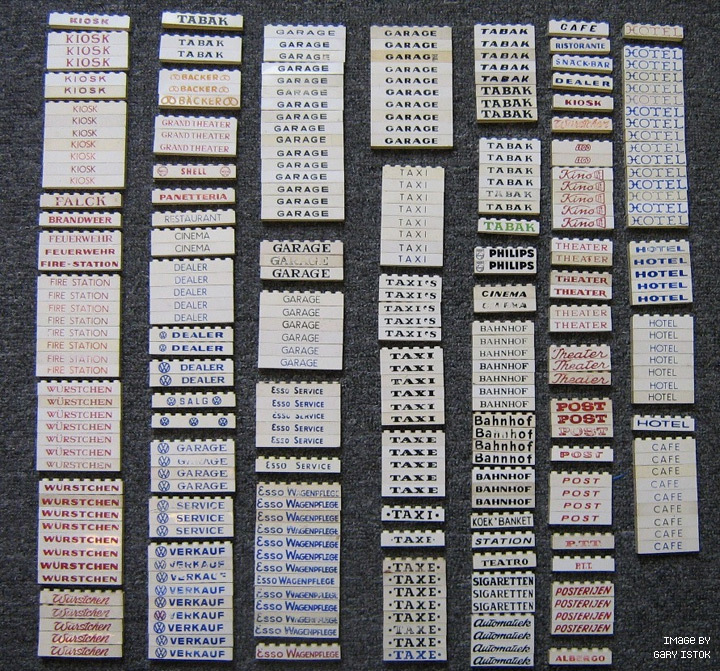 By 1962 Lego was offering printed/named bricks in Germany, Netherlands, Switzerland, Belgium, Austria, Portugal, Italy, France, Finland, Britain, Ireland, United States, Canada, and Australia. Most of these countries had bricks printed in their own native language, with one interesting exception. Lego never printed Portuguese bricks. The bulk of these printed/named bricks were made in the 1950–1960’s. Since working with ABS (Acrylonitrile Butadiene Styrene) plastic was relatively new the printed/named bricks were often misprinted. 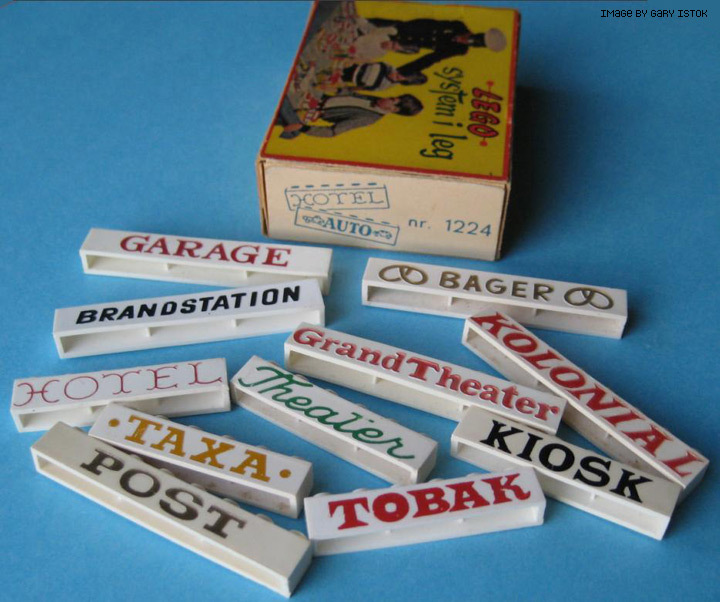 The typefaces that Lego worked with were originally hand–lettered before being transferred to the molds. There is nothing directly comparable to this printing today, the closest results are found with Flexography (Flexo) printing, which is commonly found on plastic shopping bags. A very wide variety of typeface styles can be found on these Lego bricks. Anywhere from Sans Serif, Serif, Slab Serif, Script, and Decorative styles were available. The imperfections of coming from hand–lettering greatly contributed to their personality. Some of this printing is interesting in that they exhibit reverse stress on the letters. 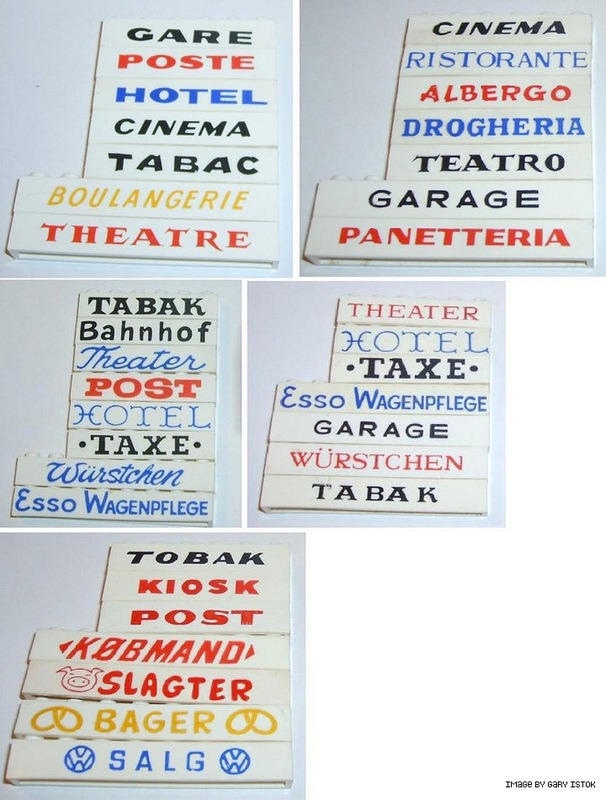 This is especially noticeable with the “TAXE” and “TABAK” bricks. As time moved on, so too did most of these unique typefaces. By the time the 1970’s came around Sans Serif typefaces were standard, and most of the charm of these named bricks started to fade. These printed/named bricks would completely die out before the 1980’s, being replaced with the much cheaper, and more versatile, sticker. Today Lego only prints a few bricks a year, and almost never text. Making this an interesting relic from the past. One last thing; some of these bricks are a product of their time, especially the “TABAK” and “SIGARETTEN” bricks. You would never find a product marketed to children today with a tobacco reference. All of the above images were provided by Gary Istok. Who, can be found on the Eurobricks website as the Lego Historian. He has written extensively about printed/named bricks/beams here, and here. 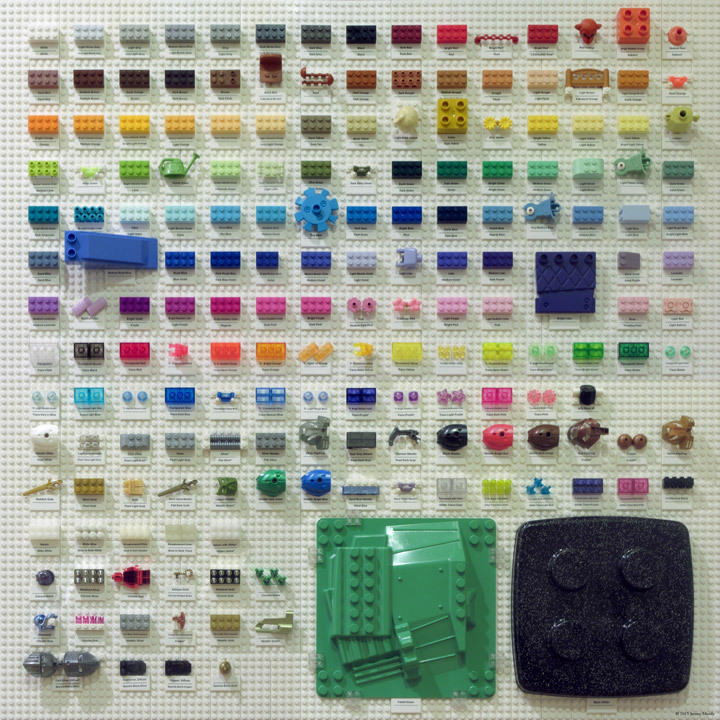 Also, for extremely detailed information about “Thousands of things you probably never knew about Lego sets, Lego parts, and Lego related items…” make sure check out Gary Istok’s “The Unofficial Lego Sets/Parts Collectors Guide (1949–1990’s)” which is available for DVD and Download. Seriously, his work is awesome.